portfolio caters to a growing market both locally and internationally. The company utilizes its latest “Indigo” digital offset press for printing high quality Plastic Cards. This is the only such machine available in Sri Lanka, and is capable of printing magazine quality copies instantly. The personalization of plastic cards are done either on the Digital Press or embossed in the format of the normal cards. 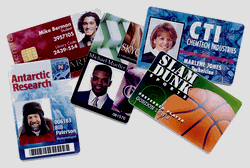 The cards are manufactured using imported PVC material to meet international standards. Personalisation: Indigo printing allows for each card to be personalized by name and number if required. Shrink wrapping - Baked plastic sheets ensure that there is no pilfering or environmental damage on cards until delivery is made. Not resealable.